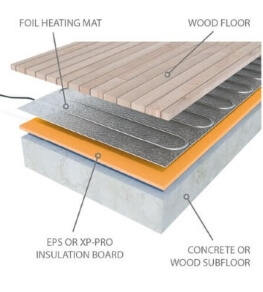 ProWarm electric underwood heating mats offer a reliable, durable and effective underfloor heating system for laminate floors, engineered and solid wood floors. The ProWarm under wood heating system has a heat output of 140W/m2. It's an ultra thin electric radiant floor heating solution, designed especially for use under wooden flooring. It's very easy to install and will heat the floor in a uniform manner - with no 'hot spots'. ProWarm underwood heating mats are available in the following square metre sizes (please choose from the drop-down box above): 1M, 1.5M, 2M, 2.5M, 3M, 3.5M, 4M, 4.5M, 5M, 6M, 7M, 8M, 9M, 10M, 11M, 12M, 13M, 14M, 15M, 16M, 17M, 18M, 19M, 20M, 21M, 22M, 23M, 24M. The maximum mat size in one piece is 12m2 - anything larger is supplied as multiple mats. Only 2mm thickness - one of the thinnest solutions on the market. ProWarm CableSafe Warranty. Accidentally cut through your heating cable, and Pro Warm will replace your cable free of charge. 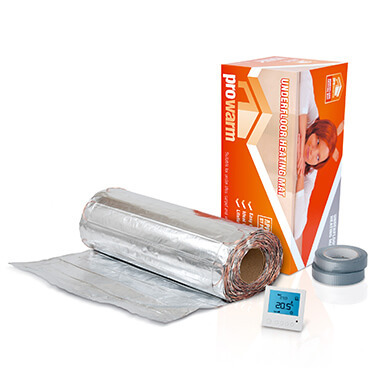 Please note: ProWarm underwood heating mats must be used with either ProWarm ProFoam or XP-PRO insulation boards. Where possible we recommend using the 10mm thickness XP-PRO boards. The product is supplied with detailed, full colour instructions for easy installation. You can also download a PDF document of the Prowarm underwood heating installation instructions manual. Made with Fluoropolymer insulated heating cables sandwiched between two layers of specially reinforced aluminium foil. The uniform spacing of the heating elements, further backed by the aluminium foil, ensures even heat distribution. The heating element is connected to a power supply cable, which is situated in one corner of the mat. The power lead is a flat thin two core flexible cord, consisting of two insulated conductors with a metal sheath and an outer sheath. Heat output of 140 W/m². Available in predetermined lengths with a cold tail – prefabricated and tested in a carefully controlled factory environment.